About Us – Crystalworks Designs Ltd. The gallery was outfitted with renewable bamboo millwork, recycled material countertops, energy efficient lighting, low VOC paints, energy smart appliances, and finishes and furnishings crafted with sustainable materials. Each and every object, from the smallest tumbled stone to the largest specimen, is hand selected by the owners for its beauty and perfection. Crystalworks’ mandate is to sell only ethically mined minerals. We do not sell dyed, man made or radiated crystals, or cave formations such as calcite stalactites or stalagmites. We have enjoyed close friendships with our miners and mineral dealers for over 25 years. This allows us access to rare and unique specimens which normally would disappear into private collections and never make it onto the open market. With our new space it was our goal to create a modern, tranquil and healthy “green” environment in which to explore the beauty and creativity of our Earth. 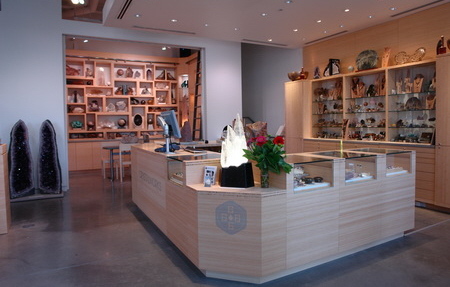 To this end, the gallery was outfitted with renewable bamboo millwork, recycled material countertops, energy efficient lighting, energy smart appliances, as well as all finishes and furnishings crafted with sustainable materials. 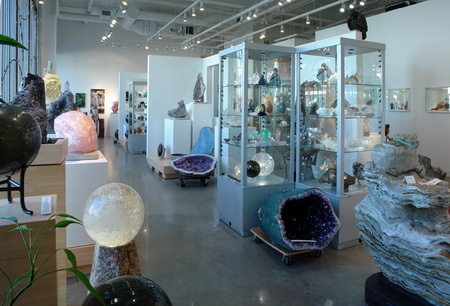 The floor of the gallery is infused with chlorite sand to help clear and ground the intense energies within the store. What makes Crystalworks a ‘Green’ gallery? At Crystalworks we believe that being a “green’ company means more than just using recycled toilet paper (although we do this too). We believe that a green company acts with integrity. We believe that benefiting the environment also means that those that live in the environment are benefited as well. We think that to be ‘green’ a company must conduct business in an open hearted way and for this reason we practice cross promotion, networking and other cooperative business practices. Below you will find more detail on the green products we have used and the vendors we have worked with on this amazing project. 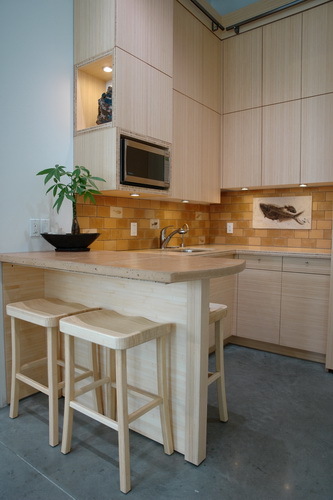 Bamboo furniture (stools and chairs) by Ecodesignz and Squak stone counter tops by Tiger Mountain Innovations. This counter top material is a fibrous-cement material comprised of recycled paper, recycled glass, coal fly-ash and cement. Material is hand-cast into “slabs” as an alternative to natural or quarried stone. All of our countertops are off cuts, miscolours or scraps. We have incorporated this material into our displays. Its Strong: Bamboo can withstand a great deal of use without damage. It’s stronger even than oak, considered the most durable hardwood. When laminated, bamboo is nearly as strong as soft steel. Bamboo doesn’t swell or shrink as hardwoods do, making it ideal for furniture and floors. It Grows Fast: Bamboo is not a tree—it’s a grass, and it grows like one. Many species of bamboo can grow two feet or more a day. When it’s harvested, it need not be replanted, because it will grow a new shoot from its extensive root system. So bamboo renews itself readily, unlike hardwood trees, which, once cut, are gone forever. Bamboo is an endlessly renewable resource. It Enhances the Environment: Farmed bamboo stabilizes the earth with its roots, preventing erosion. It takes in greenhouse gasses and produces oxygen. In fact 35% more oxygen than an equivalent stand of trees. It can also provide habitat for birds and animals (though our bamboo is not preferred by pandas, and is therefore panda-safe). Its World-Wide and Historic: Our bamboo comes from China, but the adaptable bamboo will grow most places on earth. Wherever it is native, bamboo has been integral to the economy and culture, used for cooking, beverages, paper, houses, and bridges. In China, it’s known as the “friend of the people”. Since 1999, Ornamentum has manufactured contemporary furniture for interior designers, architects and private clients across Canada and the United States. Each Ornamentum furniture piece is bench made from start to finish, and then signed and dated by an individual cabinetmaker. This fabrication method allows us to precisely articulate the designer’s intent in appearance, fit and finish, as our clients demand furniture that is unmatched as a collectable and individual work. Our bamboo laminate is made with E-1 glue, which meets tough European standards for off-gassing. Some laminated products emit formaldehyde long after manufacture, but the Ecodesignz furniture in the gallery is virtually formaldehyde-free. Parts of the bamboo that aren’t suitable for furniture are used for many other products, like the laminate used in the gallery. Though the bamboo is fast-growing and renewable, we’re still committed to using bamboo products without waste. All exhibit plinths are made from MDF that is formaldehyde free, and made from recycled materials supplied by Moco Sustainable, a company that serves as a sales representative for a group of FSC-certified operations. Greenworks Building Supplies also provided bamboo plywood. Trays by Woodpak made from wood salvaged from a guitar manufacturer. They are lined with cork (another renewable resource) from Jelnik. Low flush toilet in our bathroom and energy efficient and energy star appliances in our kitchen. Our flooring is polished concrete (the slab on which the building rests) impregnated with a non-toxic densifier and polished to a sheen by Western Substrate. All of our toilet paper and paper towel is made from recycled paper products. Postcards, business cards and promotional materials are printed on 100% recycled stock from Green Printers. Eco-tread rubber tiles made from recycled running shoe treads.